Veneers are thin artificial coverings that are applied over the front of your natural teeth. Veneers are used to correct the appearance of chipped, cracked, or gapped teeth and tooth discoloration. There is more than one type of veneer from which to choose. Composite “direct” veneers are a thin composite material that is bonded to the tooth surface. They are typically less expensive than other options. Composite veneers last from about three to five years. They are applied in a single office visit. Traditional porcelain “indirect” veneers are very thin. They are typically the most expensive type of veneer. Traditional porcelain veneers last about 5 to 10 years or more. They may require a few office visits. You may be a candidate for veneers if you want to improve the way your teeth look. Veneers improve the appearance of chipped or broken teeth. They cover teeth with tiny holes or pits. Veneers can give you a white smile if your teeth are discolored from coffee, tea, wine, and cigarette smoking. If you have a gap between two teeth, veneers can make the gap disappear. Your dentist can determine if you are a candidate for veneers by reviewing your dental history and examining your teeth. Tell your dentist about your present concerns and expectations for veneers. Your dentist can help you select the type of veneer that is most appropriate for you. Composite veneers are bonded to your teeth in a single office visit. Traditional porcelain veneers and Lumineer porcelain veneers are fabricated from molds made of your teeth. 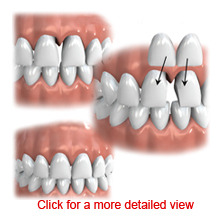 They are designed to match the color and shape of your natural teeth. A temporary veneer may be worn while a traditional porcelain veneer is being made. Your dentist will lightly buff your tooth surface before applying the veneer. This removes a small amount of enamel from your teeth. A bonding agent is applied and the veneer is adhered to your natural tooth. A light beam is used to harden the bonding agent. Veneers are irreversible because a small part of the tooth enamel is removed during the adhesion process.